Technology shapes every facet of Canadian life. But will it hurt or help us? Most discussions take a hard line: Technological advancement is either demonized as a job-stealing, privacy-violating terror; or beatified as a panacea come to rescue us from our worst selves. But there’s a middle ground—a way forward that shapes technology to benefit us, building the kind of society we want atop it. With proper stewardship, technology can make all lives better. In the immediate future, it can streamline the way countries govern today, improving antiquated processes and updating how citizens and the government interact at every level. In the long term, we can reimagine what’s possible for nations, anticipating pitfalls while putting the best innovations to work. Rather than sitting idly by and letting the future happen to us, let us shape it to our better selves. Download a copy of this manifesto as PDF to read it offline. The iPhone is just a decade old. Digital connectedness has burned through our lives like wildfire, searing small screens into our everyday. This gives us a unique opportunity to improve—and even rethink—how government works. This doesn’t mean technology is a panacea. Quite the opposite: Without proper guidance, access becomes exclusion; algorithm becomes prejudice; standardization becomes monopoly. 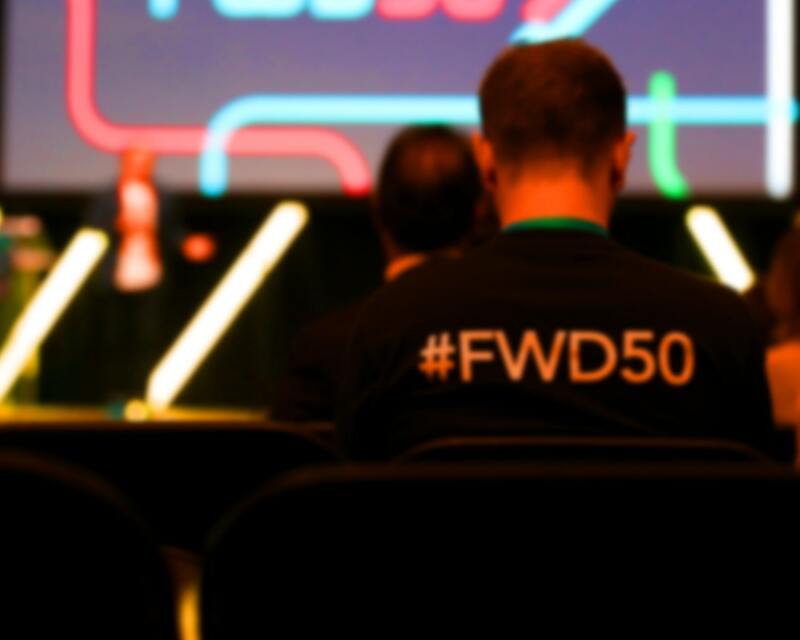 FWD50 explores this transition, marrying policymaking, technology, ethics, and invention. Rather than a vendor-centric expo tradeshow, we are platform for discussion and exploration. We encourage a dialogue between public- and private-sector innovators, gathering citizens, businesses, politicians, technologists, civil servants, and outside experts from around the world. Together, we’re using technology to build the future we want for all. Streamline today while imagining tomorrow. Create an environment where everything is up for discussion. Focus on small ideas with big consequences. Be clearly benefiting all of society. Reimagine government as a platform on which we can build things. How can we streamline today’s government with easy wins—changes to policy and process that can happen in 50 days—but remain cognizant of a longer view that considers what kind of country we want to live in in 50 years. In almost every interaction between a citizen and a government, technology can improve the effectiveness and efficiency of the interaction. We’ve seen how simple interfaces—Craigslist, Facebook, AirBnB, Wikipedia, Uber—can create an entire industry in sales, publishing, housing, shared knowledge, or transportation, without any real assets. The right interface can unlock tremendous potential, at scale, very quickly. Consider the steps someone must take to report fraud to the federal government; despite an option to remain anonymous as a reported of fraud, the user must complete a lengthy GCKey account creation process, which itself has a number of fundamentally bad security practices. Realize that 70% of immigration inquiries are simply those of applicants asking for a status update on their paperwork. This kind of inquiry should involve exactly one person—the applicant. To get an OHIP card, you need to provide proof of rent. The service bureau won’t accept copies; it has to be an original lease. But if a landlord uses Docusign for rental contracts, there’s no way to submit the original form. Bureaucratic processes need to keep pace with consumer innovations such as digital signatures, ubiquitous photography, two-factor authentication of passwords on mobile, etc. Look at how bureaucratic processes can be streamlined when married with assisted, navigational tools such as chatbots. Botler.ai, a Montreal startup, helps immigration applicants navigate the process of applying for immigration. This model is well suited to any process with a wide number of possible outcomes conditional on many factors such as background, documentation, and questionnaire response. The digital orchard is heavy with low-hanging fruit, and we must identify opportunities to produce quick wins at the national scale that not only benefit, but delight, citizens. The shopkeepers believe there is insufficient parking in the downtown core, and are clamouring for a parking structure. On the other hand, city planners, thinking about the impact of self-driving cars, worry that such investments will become unnecessary when cars can park themselves, or with the changing mix of public transport options that will emerge in coming years. As a result, they’re looking at whether applications that show citizens available parking can resolve the issue—making parking easier, and tackling shopkeepers’ objections with hard data. This is a common dilemma when trying to anticipate the future. In the late 1800s, the largest cities in the world were overwhelmed with horse manure. 50,000 horses in London, and 100,000 in New York, littered the streets with millions of pounds of manure, urine, and carcasses. In 1894, The Times of London predicted that “in 50 years, every street in London will be buried under nine feet of manure.” At the world’s first international urban planning conference in New York, participants were unable to agree on any kind of solution. Of course, by 1912, horses had been replaced by cars, and the problem vanished. In an era of unprecedented digital advancement, where vanishingly cheap technology and a connected population are the norm, we must not lose sight of the future. We have to remember how technology might fundamentally alter policies, or make current concerns meaningless. FWD50 is forum for finding this balance of pragmatism and possibility. We’ll distinguish between perennial problems and temporary issues, based on first principles of the society we want to maintain and improve. North America lags the world in digital payments because North America had credit cards first. It’s a truism of innovation that early success means you settle for the first solution, letting others leapfrog over you. China didn’t have the Web; it’s a world leader in mobile apps and payments. Africa didn’t have wired telecommunications infrastructure, so it’s able to deploy wireless today. If a new country wanted to create a power system, it might eschew the central grid in favor of rooftop solar. The problem is simple: We consider sunk costs when evaluating future benefits, even though it’s dangerous to do so. This is one of the many reasons that governments and legislation are often playing catch-up to technology. The nature of a common law model—where the real world must happen first before we can legislate upon it—is another factor. The technical lag of government has important, unintended consequences, however. Entrepreneurs rush in to satisfy consumer needs where the government does not, leaving the government unable to build a desirable solution. Tax preparation software is an excellent example of this. Companies generate billions a year in tax software aimed at simplifying the process of tax filings. This also removes pressure on government agencies to improve tax preparation processes—and the vendors’ lobbyists have no interest in simplifying the tax code. Should government be making tax preparation as easy as possible, even if that means competing with the likes of Turbotax? A similar debate is happening around services like Twitter (valuable to the world as a news source and method of public discourse, but perhaps financially unsustainable.) The Atlantic recently put forward the case for a taxpayer-funded version of Facebook, arguing that public social media needs to exist to counter hermetically sealed filter bubbles that polarize right-wing voters. In the coming years, this kind of software “eminent domain” will be more and more commonplace. Google’s transit instructions are a boon to municipalities who can’t create their own applications, making public transit more accessible than ever. But what if Google decided to charge? As we redefine the role of technology in the relationship between citizens and their government, we will naturally have to tackle the question of which private sector digital platforms become public sector, despite how uncomfortable and politically volatile such discussions will be. Government has finite attention and willpower to effect technological change. To make the best use of our resources, we need to pick simple changes that have wide-ranging beneficial consequences. One of the goals of FWD50 is to identify these small ideas that can have outsized impacts. They must by nature be simple and easily communicated: For example, collect data once. The Estonian government implemented a simple policy that had far-reaching effects. By making it illegal for the government to collect a piece of data on a citizen more than once, they forced government agencies to implement secure, consistent data exchanges. They also streamlined tax preparation, because the government can’t ask citizens how much they earned—they’ve already been told thanks to employer pay stubs. As a result, the average Estonian files taxes in under 20 minutes. To focus on specific, deliverable outcomes, FWD50 will focus on audacious, often counter-intuitive, even subversive, recommendations for improvements. These will be initiatives in which simple, targeted changes produce a wide range of benefits for the most stakeholders. The philosopher John Rawls proposed a thought experiment for devising the fairest society. Using the Veil of Ignorance, Rawls suggested that if we were creating a society, we should do so without knowing who we would become in the society we create. If, for example, half of the society were slaves, we would have a 50% chance of being a slave once we were finished creating the world. We should adopt this model when considering the impact of technologies on Canadian society, and how to govern them. Technology is widespread, but by no means universal. The roles and rights of the disabled, multilingualism, indigenous populations, and other threads in the Canadian tapestry must all be included in any digital future. This means not only ensuring accessibility to resources, but also being aware of unintended consequences—for example, predictive algorithms that reduce crime can also marginalize populations; a formula that determines who gets welfare may fail to include factors such as mental health, or childhood infirmity. One of the cornerstones of FWD50 is that government is not only an institution, but a platform atop which better coordination can happen. Governments can give us access to our online data in a seamless way, actively notifying us when and how it’s being used, and providing secure ways to manage our identity and federate ourselves with useful applications and other organizations. Governments have traditionally been the keepers of our most sacred data—from medical history, to criminal record, to education and accreditation, to income. But in recent years, data science and pervasive algorithms mean that companies, not governments, know more. Online properties today collect hundreds of facts about every visitor. They infer details about our musical tastes, gender, income, credit risk, and more, stitching our likes, clicks, inboxes and quiz responses together into a digital quilt that mirrors our true selves. The rise of big data means we no longer find a suspect and collect data on them; rather, we collect data, and find suspects within it. To many, this feels fundamentally, morally wrong. Unless there are good reasons to do otherwise—for example, when someone is under criminal investigation—a citizen’s data should be available to them in secure formats. Similarly, a person who can review their entire life on Facebook will soon realize that to not be able to do the same with their government data is unacceptable. We can be proactive as a nation in this regard. Within a decade, a digital timeline will be the dominant model of managing our lives, online and off. Our inbox is already the logfile of our life, full of airplane receipts, Amazon purchases, calendar invites, and bill payments. We will find a way to share information properly with citizens, so that nobody knows more about their lives than they do. This is a cornerstone of government as a platform. Once platforms are trusted, we can dramatically accelerate the delivery of services atop them, reducing costs while improving accessibility. Transparency is fine. But there is a vast difference between simply making data available, and telling someone that data is being used. For example, credit scores are available to most consumers, but few check them. Banks now notify customers when their credit scores have changed, making it far easier for them to identify fraudulent behavior or change spending habits that might affect them later. We can take a similar approach to data transparency. If government data is being accessed—by the private or public sector—the citizen should know. This was once impossible, but is now commonplace on online platforms: It happens every time Facebook notifies you when someone mentions you in a post. In an era of two-way communication infrastructure, passive information is not enough. Citizens expect to be notified of things that matter to them. Government as a platform not only provides trusted access and accurate information about someone, it also gives them the tools and notifications to become an active participant in how their data is used. When a user signs into a website, they generally employ a combination of username or email, and password. In some cases, they use two-factor authentication. But they can also log in using the authentication of a major online property such as Google, Facebook, or Twitter. This login process, based on the Open Authentication Protocol (OAUTH), also grants the website access to certain permissions on the authenticating platform: Posting to a Twitter feed; seeing a user’s Facebook social graph; reading archived emails in GMail; etc. It is in the interest of the large Internet properties to do this, because they get extra visibility into site visitors and their activities. Having an OAUTH that can be used to authenticate instead of using a password would significantly improve the security of many Canadians, particularly children and the elderly, as the government would have a strong method of enforcing reliable security behaviour. Unlike private interests, a federal OAUTH wouldn’t have commercial motivations behind handling authentication. Citizen government programs like Code for Canada could use OAUTH to let Canadians connect applications to their government information within the controls afforded to them by the user—and remove that access at any time—in the same way that a Google user can give an app access to a calendar, then revoke it. Modern challenges are legion: Collecting the will of its citizens; including marginalized populations; policing crime; regulating scarce goods such as healthcare, food, or energy; balancing welfare and incentives; taxation; and more. Technology changes almost all of these in some way, from predictive policing to vertical farming to robotic telemedicine. And inventors, startups, and big businesses are working to solve many of these problems. We also embrace the tension inherent in a constitutional democracy: The constitution protecting the rights of the individual, and the democracy championing the will of the many. Technology has displaced many societal norms, forcing populism and special interest to renegotiate their ends of the Overton Window. We strive to balance these in our lineup, our writings, and how we think about the problem and promise of tech. What policies and processes can be changed in 50 days? We don’t pretend that culture can change overnight, but a short focus emphasizes quick-win shifts and rapid procurement and deployment. What platforms can be built in 50 months (roughly an electoral term)? Technology initiatives can be built in far less than 50 months with agile development approaches, cloud computing, continuous deployment, and other IT innovations. But for a platform to be successful it must enable higher-order functions atop it, which takes time. What can we aspire to in 50 years? This is where we look at “moonshot” initiatives: What could socialized medicine be 50 years from now? Will our ability to diagnose everything mean we treat diseases that wouldn’t kill us? If we can upload consciousness to a machine, who pays for it? FWD50 is a movement to bring a discussion about our better selves to the forefront, and leave with concrete decisions and specific plans about how to get there. To this end, we’re gathering experts from around the globe to tackle some of society’s most challenging problems, showing the private and public sector what’s possible with modern technology. We’ll have succeeded when we move towards a better future for all of us. 1. A chatbot is a user interface that employs conversational back-and-forth interaction with a user towards a particular goal, such as troubleshooting a problem or filling out an invoice. While often conflated with Artificial Intelligence, a chatbot can simply be a set of canned responses. 2. The philosopher Gottfried Liebniz was once asked why—if God was good—was there evil in the world. His reply is known as the Best Of All Possible Worlds argument. Part of his argument relies on the idea that if there is evil, it produces more good; in a world without evil, for example, there can be no heroism, no bravery, and no courage. Another way to interpret this is that the best of all possible worlds is the one in which the fewest starting conditions lead to the most possible outcomes.